The postcards are all from the 1910’s and could safely be called colonial. 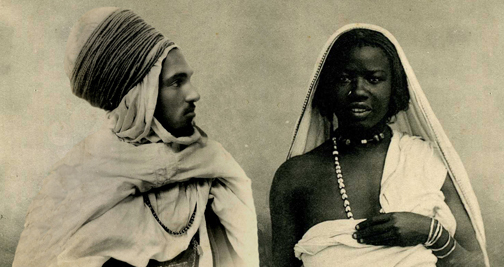 Colonial photographers, while choosing beautiful faces to look upon, would categorize each — often incorrectly and presumptuously — by race, tribe, nation, and publish their finds as postcards for collectors and armchair anthropologists. Heretofore unpublished friendships defy the colonial gaze: they are eager, attentive, long-awaited to my eyes. Incident in a date palm forest. Heat rises against a slow shower of dates. But time’s course takes a sudden diagonal turn: the lover sees her object and delivers a blast of light sideways.